PT Photo Editor is a simple and efficient application designed to bring your images to life and make them look their best. 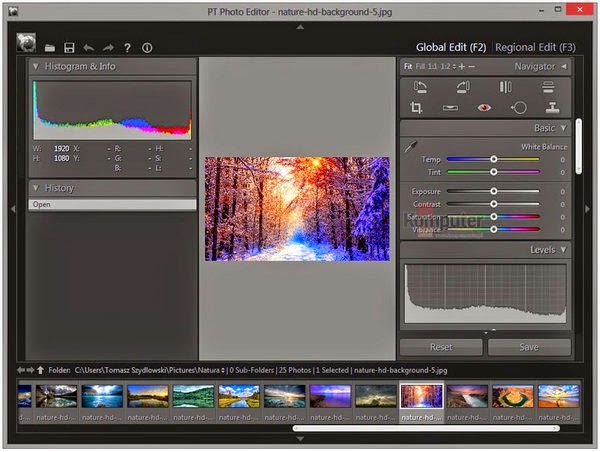 With PT Photo Editor, you can quickly correct color casts, solve exposure problems, remove imperfections, enhance color tones, and turn every photo into a work of art with your creativity. With just a click, White Balance tool can help you remove color casts, restore a real photographic scene. Several brightness adjustment tools that allow you to cope with common photo exposure problems easily. Bring out the colors in your shots with flexible color adjustment tools. Improve sky, flower and even skin tone with just one click, making them look their best. Easy to use editing tools help you crop and straighten pictures quickly, remove blemishes, correct red eyes, and erase unwanted objects, get rid of the nasty imperfections. Use Sharpening and Noise Reduction Tools to make sure your photo is perfect in every detail. Creative regional editing functions bring you more flexible and convenient operation experience, inspire your creativity, create extraordinary images. Full-time 16 Bit Processing: With full-time 16-bit per channel processing architecture, make advanced color adjustments to an image while keeping its color rich and vibrant. Color Management: PT Photo Editor is fully color managed. So the colors in your image will be displayed correctly no matter what color space you’re using in your workflow. And you can convert your edited result to any specified color profile. * Add Lens Correction tool in “Global Edit” module. * Support dragging with right-button to pan image. * Support show/hide region effects.